Cheesecakes are a delicious dessert, but they seem to become even more irresistible when they are scaled down into small, single serving sizes. I attribute this to the fact that cheesecakes are not only decadent, but rather filling, and it is easier to resist a large slice of a full sized cheesecake than a small and snackable version. They also take much less time to bake from start to finish, so you can get your cheesecake fix much more quickly. 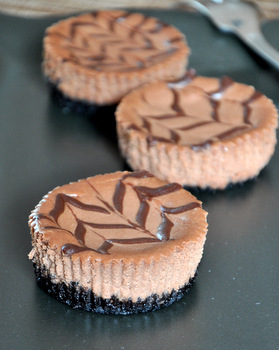 These Chocolate Mini Cheesecakes with Chocolate Crumb Crust are for those who love chocolate as much as they love cheesecake. The cheesecake filling is flavored with cocoa powder and melted chocolate, and it sits on top of a chocolate crumb crust. The crust adds a nice crispy texture to the cheesecake and, since the chocolate wafer cookies used to make the crust actually have a very intense bittersweet flavor to them, they boost the chocolate flavor very well. The filling isn’t as rich as a chocolate truffle would be, but it has a nice chocolate flavor and you can still taste the tang of the cream cheese in every bite. Speaking of bites, you will probably get 2-4 bites from each mini cheesecake. I decorated the tops of my cheesecakes with a little bit of cheesecake batter that I tinted with a bit of the melted chocolate. If you want to do the same thing, simply mix about a tablespoon of chocolate cheesecake batter into a tiny bowl with whatever melted chocolate didn’t make it into your batter when you poured it in (in other words, save a very small amount of it, just enough to change the color of the reserved cheesecake batter). Pour this into a piping bag, pastry cone or a ziploc bag with the corner snipped off and pipe stripes of dark batter onto the top of each mini cheesecake before baking. Drag a toothpick through the stripes to create the zig-zag design ( and be sure to watch a how-to video here). There are mini cheesecake pans on the market, but I made these in regular muffin cups lined with paper liners. To get the cheesecakes out of the muffin wrappers, be sure to chill them thoroughly in the fridge before serving – once they’re cold, the wrappers should peel off easily and you’ll be able to dig in. Preheat oven to 350F. Line 8 cups of a muffin pan with paper liners. In a medium bowl, make the chocolate crumb crust. Mix together chocolate cookie crumbs, sugar and salt and stir to combine. Pour over melted butter and stir with a fork to moisten the crumbs. In a large bowl, make the cheesecake. Cream together cream cheese, yogurt and sugar until smooth. Beat in the egg, vanilla extract, cocoa powder and melted chocolate until mixture is very smooth. 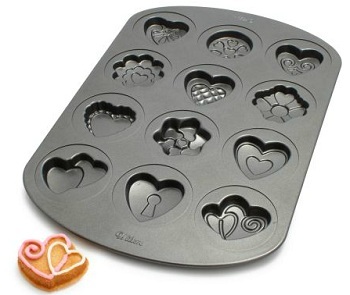 Divide cheesecake mixture evenly into prepared muffin tins (Reserve one 1 tbsp of batter to tint with melted chocolate and decorate tops as described in the post, if desired). Bake for about 16-19 minutes, until cheesecakes are set. Allow to cool for 15 minutes in the muffin pan, then carefully transfer cheesecakes to a cooling rack to cool completely before refrigerating. This recipe looks wonderful and it’s truly worth a try! These mini cheesecakes are great ! I tried the recipe and they turned out very good on the first try. Plus, they’re super easy to make, so I recommend them to anyone who wants an easy and excellent dessert to make.